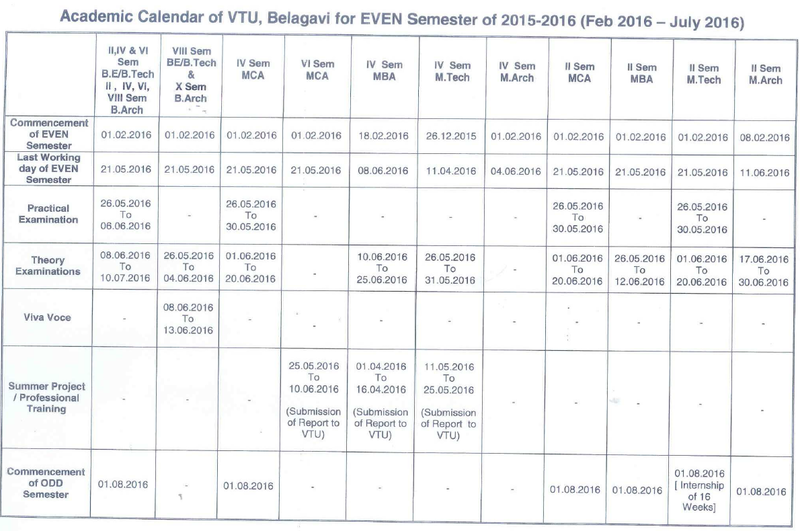 Discussion in 'Academic Calendars' started by Updates4u, Dec 21, 2015. The Academic Calendar of the University for the EVEN Semester for the academic year 2015-16 is hereby notified as enclosed. The Principals of affiliated engineering colleges, a Constituent College (UBDTEC, Davangere), PG Departments of VTU conducting BE./ B.Tech./ B .Arch./ M.Tech./ M.Arch./ MBA / MCA courses, are hereby informed to bring the contents of this Notification to the notice of all the concerned.